Microsoft is keen for manufacturers to build smartphones for its Windows Phone 8 OS, but Acer isn't willing to bite this time. Acer isn't alien to the Windows Phone game as it launched the Windows Phone 7.5-toting Allegro in 2011, but it's yet to venture into the latest version of platform. 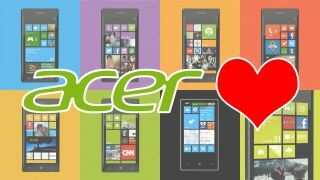 Allen Burnes, Acer's VP of Smartphones for EMEA told TechRadar: "We are looking at Windows Phone 8, we think it's a great OS. The integration with Xbox is nice, the enterprise suite is nice, but I think no one knows about it." Burnes continued: "You'll find everyone in our smartphone team would really like to deploy Windows OS, but in relation to where we are as a company we have to make our decisions in relation to what we think will sell out. "We've made the decision not to launch a Windows Phone 8 device this year. Next year, depending on how we see the growth go this year, we may well do." Acer wants to hear more from Microsoft on the new platform. "What they [Microsoft] has to do is communicate. They can't rely on Nokia, which has its own challenges of rebuilding its brand, to do it for them," he said. The Taiwanese firm is also looking at the bigger picture when it comes to Windows, with clear benefits across its PC, laptop, tablet and smartphone divisions. "The way WP8 integrates in with the rest of the Windows ecosystem is phenomenal," Burnes says, "so yes we are looking at Windows Phone 8, yes we do believe in it, it just doesn't sell enough at this moment, otherwise we would deploy it this year."